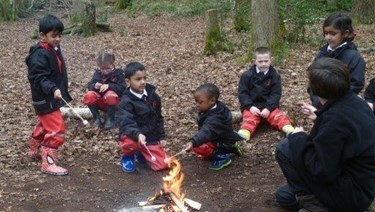 This week it was the turn of Mrs Lock’s class to visit the woods. We looked up at the trees and noticed differences between them – either having leaves or not and introduced the words ‘evergreen’ and ‘deciduous’. Hopefully the children have been spotting these trees on their journeys to school this week …? We heard that many of the children did lots of exciting activities over half term and the children wrote about them in their writing books. Several birthdays, roller skating, visiting Grandma’s house and lots of eating out!!! In ICT we had a challenge to find our way around a variety of scenes using directional cues. We started with simple instructions and progressed to helping a mouse find its way out of a maze. We had great fun and mostly all went well, until the mouse left the screen and the reset button was forgotten!